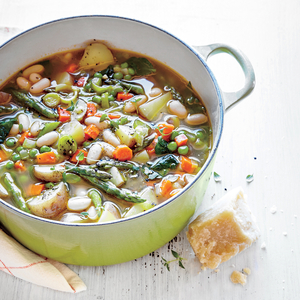 Hearty and healthy, this is a satisfying and delicious soup made with lots of veggies. Dovetailing Tip: If you prepared your vegetables on Day 3, you can begin with the preparation immediately. 1. Heat a large saucepan over medium heat. Add oil; swirl to coat. Add carrots, leek, and celery; cook 5 minutes, stirring occasionally. Add salt, pepper, and garlic; cook 1 minute, stirring frequently. Add stock; bring to a simmer over medium-high heat. Add potatoes; reduce heat to medium, and simmer 8 minutes or until potatoes start to soften. 2. Add peas, asparagus, and beans; simmer 4 minutes or until vegetables are crisp-tender. Add spinach, thyme, and basil; cook 1 minute. Ladle soup into bowls; top evenly with cheese.